Sometimes it’s hard to tell an extravert from an introvert. It shouldn’t be, but it is. Many introverts have a public persona that seems to say, “I’m a people person!” Yet being sociable is something the introvert can’t maintain for long. After an hour or two in a group, the introvert is ready to head home. 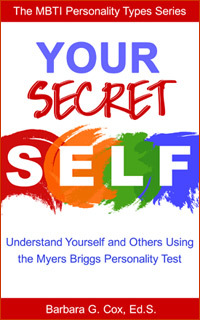 Extraverts, on the other hand, are just getting started. They are energized by social contacts. It’s too much solitude that wears them down. Introverts are private by nature. They may have one or two close friends but don’t enjoy doing things in crowds. They require time alone. They’re also independent thinkers who don’t need others to help them make decisions. They dislike conflicts but they’ll stand up for what they believe in. If the issue is important, they can be surprisingly forceful. Extraverts recharge their batteries by relaxing with other people. They’re outspoken most of the time, not just when they have strong feelings. They often prefer talking to listening. 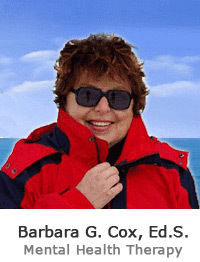 When the phone rings, the extravert is likely to jump up to answer. The introvert is glad to let him or her do it. If left on their own for long, extraverts get jumpy and start looking for people to talk to. 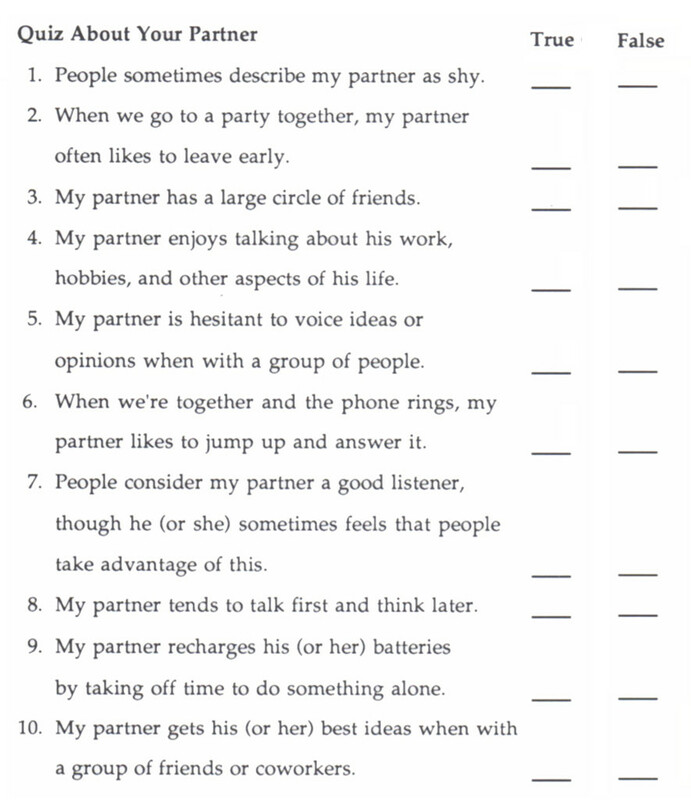 If you’re wondering where you and your partner stand on the extravert-introvert scale, take these two quizzes. When an answer seems neither totally true nor totally false, pick the more correct of the two answers. 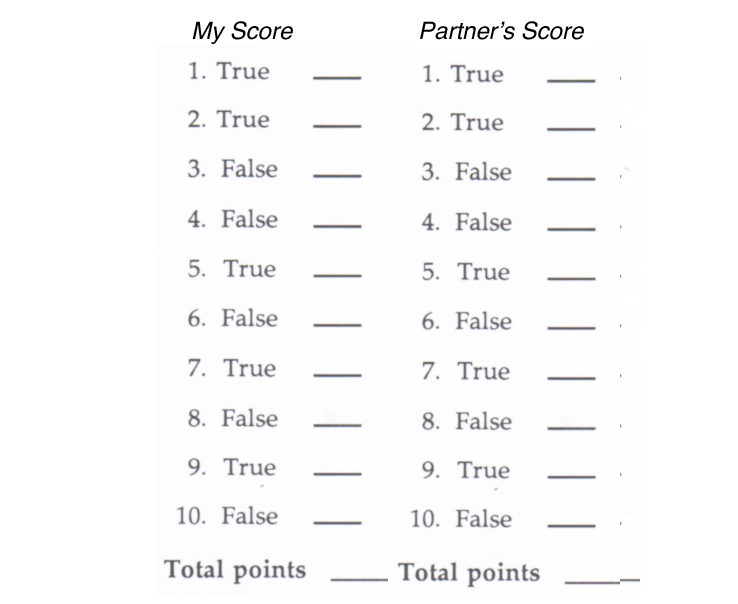 Using the scoring key below, figure out the total points for both of you. A score of 8-10 indicates pronounced introversion. The introvert may have a couple of close friends but generally dislikes being in crowds. 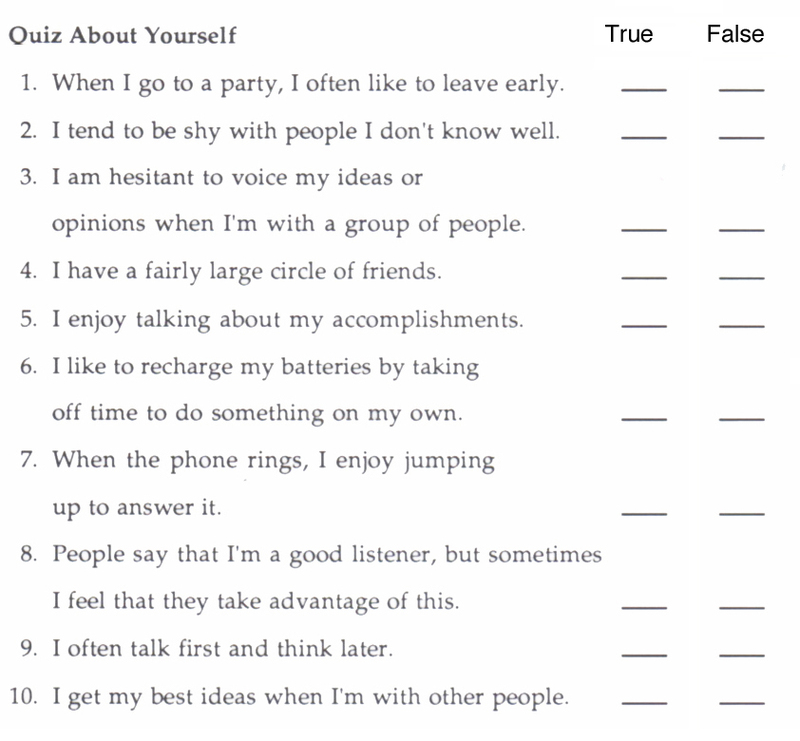 A score of 4-7 means the person enjoys spending some time alone but likes to socialize, too. The person who scores 1-3 needs to be around people a lot of the time and may get uneasy if without company for a long period.